Cigar enthusiast Jim Topp wasn't allowed to smoke at home. So he did what any sensible man would do and commissioned a 600 horsepower supercharged 1965 Mustang custom convertible to be built so he could smoke his cigars on the road. "It seemed like a pretty good idea," Topp told Cigar Aficionado, proudly standing by his car on the convention center floor at the 2015 Big Smoke Las Vegas. "And I've always loved Mustangs." 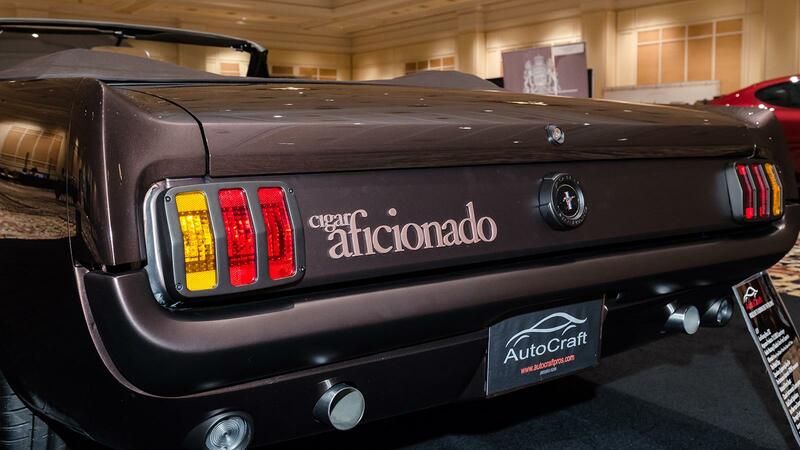 The car is painted a rich tobacco brown, emblazoned with the Cigar Aficionado logo near the left taillight, and outfitted with an array of high-end cigar tools in the center console that include an electronic humidor, cigar lighter and motorized cigar cutters that jump alive at the touch of a button—all custom fitted to blend with the body of the 50-year-old muscle car. "I wanted to keep the look as close possible to that of an original Mustang," Topp said. Built by AutoCraft, of Camarillo, California, Topp's car started out as a bone stock, six-cylinder 1965 Mustang. The engine was replaced with a Ford Racing Boss 302, running a custom Magnuson 1900 TVS supercharger system, which, a representative from AutoCraft confirmed, "Gives her about 600 horsepower." The exhaust system is also custom, hand fabricated from stainless steel. The list of modifications and improvements to the bronze beauty is long and impressive, including a custom Art Morrison 4 link rear suspension, vintage Shelby Cobra wheels and a Bolivian rosewood steering wheel. But the overall look is one of understated style. A master of understatement himself, Topp, in closing, had this to say about his car: "I'm just looking forward to driving around and smoking some good cigars."